A number of plants have leaves resembling elephant ears. The common name "elephant ear plant" can refer to any of them. What these plants have in common are large leaf blades shaped like hearts, shields or rounded arrowheads. In some species, the leaf blades reach 3 or 4 feet in length. Many elephant ear plants grow in tropical climates, although velvet elephant ear is a drought-tolerant leaf succulent growing in arid regions of Madagascar. The tropical genera grow from edible tubers or corms. Alocasia leaves often possess contrasting veins and textured surface. Alocasia is a tropical plant genus with large, shield-shaped leaves. Leaf blades typically measure 1 to 2 feet in length, but the Alocasia macrorrhiza species can have blades up to 4 feet long. Plants in this genus grow natively in Southeast Asia and on South Pacific islands. 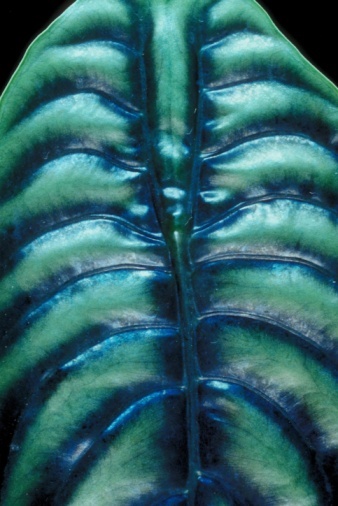 The leaf veins contrast sharply in color with the main leaf surface in many species. These tropical plants grow best in warm, moist environments out of direct sun. Members of the genus Colocasia, also known as dasheen, bear heart-shaped leaves in green, purple or copper, depending on the species and variety. Leaf blades of some species, such as Colocasia gigantea and C. esculenta, reach 18 inches in length. Smaller species, such as C. affinis, have blades less than a foot long. This moisture-loving tropical is suitable for water gardens and is susceptible to spider mite infestation if kept overly dry. Also known as tannia, plants in the genus Xanthosoma grow natively in tropical areas of the New World. Compared to the genera Alocasia and Colocasia, this group of plants has lower water requirements and greater tolerance for sun. Its leaves are typically green, but many species take on green-yellow coloration heightened by exposure to light. The plant does best in partial shade with morning sun. Native to South America and the West Indies, the genus Caladium grows best in warm locations with partial shade and constant moisture. Many members of the genus bear colorful, variegated leaves. Caladium bicolor and C. humboldtii are the two most common species grown in cultivation, and both have several varieties. Nonhybridized varieties of C. bicolor have leaf blades up to 15 inches long but newer varieties, including gingerbread caladium, have much smaller foliage. The genus Kalanchoe contains more than 125 species, most of which are small, low-growing plants. The maternity plant (K. daigremontiana) and Christmas kalanchoe (K. blossfeldiana) are two examples commonly grown as houseplants. One member of the genus, velvet elephant ear (K. beharensis) grows as a woody shrub, however. This plant is natively to the southern part of Madagascar and has large, arrow-shaped leaves covered with velvety fuzz.